Imagine catching up with your texts, social networking and perhaps the news without having to log on to a computer or even glance at a smartphone. Messages and images would simply appear in front of your eyes, generated by a computerised contact lens. Of course, you may not always want to be bothered by such messages if you are doing anything so quaint as – for instance – reading a book or going out walking and enjoying the scenery. But until now the concept of info-vision – the ability to stream information across a person’s field of vision – had belonged to the realms of science fiction, featuring in films such as the Terminator series or TV shows such as Torchwood. However, scientists have developed a prototype lens that could one day provide the wearer with all kinds of hands-free information. It could also be used to display directions and TV programmes. 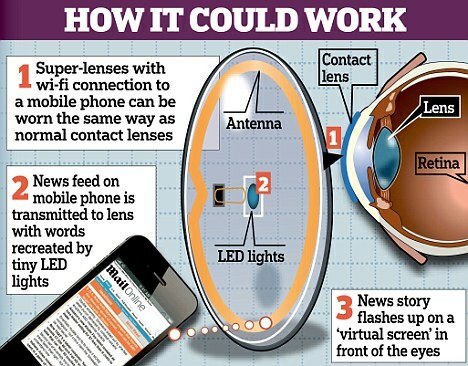 via Computerised contact lens will keep you up to date with news and texts | Mail Online. Samsung Electronics Co. overtook Apple Inc. (AAPL) in the last quarter to become the world’s largest smartphone vendor amid a widening technology and legal battle between the two companies. Apple, which released its iPhone 4S this month, held the top spot for only one quarter after dislodging Espoo, Finland- based Nokia earlier this year. Samsung, based in Suwon, South Korea, has turned to Google Inc. (GOOG)’s Android software to boost sales of its Galaxy smartphones and tablet computers. via Samsung Overtakes Apple in Smartphones – Bloomberg. Editors Note: I own an android Smart Phone. Why? Because I am the President of a video distribution website that cannot be fully viewed by Apple’s iPhone, iPad and iPod devices due to Steve Jobs’ hardheaded rejection of Adobe’s long established and standardized Flash Player software. The Flash Player plug-in is utilized by every browser on earth, and 90% of all web sites use flash generated content such as videos and banner ads. What on earth was Apple thinking by not including this universal application into its platform? The prevailing theory or excuse comes from Apple’s development department that points to the fact that in 2007 the Flash plug-in drained battery life. This may have been true, but according to Adobe, Apple refused to provide them with an advance prototype of Apple’s hardware so they could develop a solution. This is standard protocol among developers. Another theory is that Steve Jobs held a grudge against his former employee who became CEO of Adobe. This does not seem so far fetched now that so much has been revealed about Jobs’ personality since his death. Jobs’ big mistake was letting his emotions get the best of him while his number one competitor sat on Apple’s Board of Directors and was witness to all Jobs’ dysfunction. While the public was up-in-arms over the abandonment of the Flash Functionality in the new Apple iPhone, iPad and iPod devices, Google saw this weakness as an opportunity to compete hot and heavy with Apple. Now, millions of people can view every video on my website via their Android Powered Smart Phone without additional drain on the battery. This is why Samsung is out-selling Apple in Smart Phones. Don’t get me wrong, I love Apple Computer, and think of Steve Jobs in the same stratosphere as Einstein and John Lennon. That is why I am hopeful that the feud between Steve Jobs and Adobe has been put to rest in this new era of Apple and that Apple will introduce its next generation of products with Adobe’s Flash functionality. If it does, and since I have owned an Apple Computer since 1985, I will be the first in line to buy them. The Feds Will Cut Off TV and Radio on November 9th. If you have ever wondered about the government’s ability to control the civilian airwaves, you will have your answer on November 9th. On that day, federal authorities are going to shut off all television and radio communications simultaneously at 2:00PM EST to complete the first ever test of the national Emergency Alert System (EAS). This isn’t a wild conspiracy theory. The upcoming test is posted on the Public Safety and Homeland Security Bureau website. Only the President has the authority to activate EAS at the national level, and he has delegated that authority to the Director of FEMA. The test will be conducted jointly by the Department of Homeland Security (DHS) through FEMA, the Federal Communications Commission (FCC), and the National Oceanic and Atmospheric Administration’s (NOAA) National Weather Service (NWS). In essence, the authority to seize control of all television and civilian communication has been asserted by the executive branch and handed to a government agency. via The Feds Will Cut Off TV and Radio on November 9th | TheBlaze.com. “You’re headed for a one-term presidency,” he told Obama at the start of their meeting, insisting that the administration needed to be more business-friendly. As an example, Jobs described the ease with which companies can build factories in China compared to the United States, where “regulations and unnecessary costs” make it difficult for them. Jobs also criticized America’s education system, saying it was “crippled by union work rules,” noted Isaacson. “Until the teachers’ unions were broken, there was almost no hope for education reform.” Jobs proposed allowing principals to hire and fire teachers based on merit, that schools stay open until 6 p.m. and that they be open 11 months a year. via Steve Jobs Biography Reveals He Told Obama, ‘You’re Headed For A One-Term Presidency’. British billionaire Richard Branson opened the world’s first-ever commercial spaceport in the New Mexico desert, the new home for his company, Virgin Galactic. “Spaceport America,” as the site is called, will serve “as the operating hub for Virgin Galactic and is expected to house up to two WhiteKnightTwos and five SpaceShipTwos, in addition to all of Virgin?s astronaut preparation facilities and mission control,” said the company in a statement to the press. via Branson opens world’s first ‘spaceport’ in US. “For those of us who live outside of Apple’s distortion field, we known that 7in tablets will actually be a big portion of the market, and we know that Adobe Flash support actually matters to customers who want a real web experience,” wrote Balsillie. “We also know that while Apple’s attempt to control the ecosystem and maintain a closed platform may be good for Apple, developers want more options and customers want to fully access the overwhelming majority of websites that use Flash. via RIM hits back at Apple’s ‘reality distortion field’ – Telegraph. Despite knowing he was dying, Steve Jobs worked for more than a year on the products that he believed would safeguard the company’s future. It was also revealed today that Jobs fought hard to get plans approved for a spaceship-style company headquarters in California. It will be big enough to hold 12,000 employees in a park-like setting near the existing base in Cupertino. He appeared at a town council meeting in June to plead for the planning go ahead. via Steve Jobs dead: Apple boss left plans for 4 years of new products | Mail Online.